Submitted by Emily Brightwell on Mon, 2006-07-24 23:44. 'Inspector, if you don't mind me saying so,you're not making a great deal of sense. 'Witherspoon sighed silently. Minerva Kenny is a dear woman, but her tendency to "borrow" things without asking has finally caught up with her. William Barrett is holding the damning evidence but when Mrs. Jeffries and her staff try to recover it, they fnid something more shocking: Barrett's corpse! 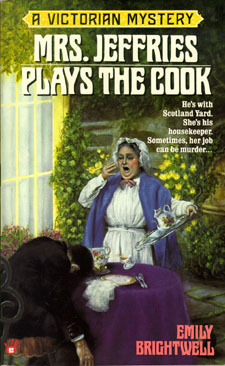 And when the Inspector's cook is called away suddenly, Mrs. Jeffries finds herself doing double duty: cooking for the household - and trying to cook this killer's goose!